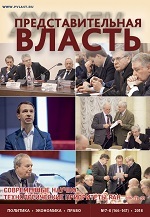 The main theme of 5, 6 rooms for 2012, the magazine «Representative power - XXI century» is a International scientific-practical conference «Theory and practice of Russian constitutionalism» (Moscow state Academy of law. Moscow, June 26, 2012). Materials of the International scientifically-practical conference: Fadeev V.I. - To the 75th anniversary of academician of the Kutafin О.Е. ; Kozlova E.I. - The memory of the outstanding Russian scientist, lawyer, public and statesman; Mikhaleva N.A. - The creative heritage of academician Kutafin O.E. - the national heritage of Russia (part 1); Komarova V.V. - On the creative achivements of the great russian academician Kutafin O.E. ; Shugrina Е.S. - Certain aspects of organizational fundamentals of local self-governmet in the works of professor O.E. Kutafin. Other important topics include articles by the following authors: Interview with the Deputy of the State Duma, people's artist of the USSR, professor I.D. 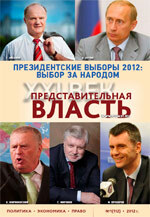 Kobzon; article the authors of the following: Denis N. Voronenkov. - Optimization of Russian legislation and the role of legal structures in the process of preparation of normative legal acts; Belyakov A.V. - Harmonization of legislations of states members of the European Union; Truntsevsky Y.V. - The penal policy of Russia in the sphere of ensuring the economic security: formation and realization problems (part 1); A.P. Lubimov. - Perspective directions of formation of ideology of patriotis; Trunov I.L. - The opposition of the majority; Cherny V.V. - Globalization of Democracy: Intellectual Revolution of “Information society” and “Dark Matter” of the Global Financing (part 3); W. George Krasnow. - Americans about Mitt Romney, Bain, Cigarettes, and Russia; Kochetov P.S., Akhmatov A.V. - Theory and practice problems withdrawals and releases of the land lots for the state and municipal needs. Several other articles also deserve mentioning: Petukhova N.V. - Federal level of regulation of the control function of the legislative (representative) bodies of the constituent entities of the Russian Federation; Ezhova M.Y. - Implementation of the law "On citizenship of the Russian Federation" in the consular institutions abroad; Morozova A.S. - Constitutional and legal status of the subsoil. Partugimov V.V. 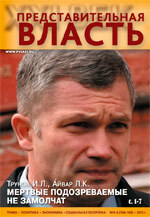 Analysis of the problems of modern Russia's political modernization;Lysenko V.I. Review of the publications of the Russian public institute of electoral law on the international observation of the last federal elections in Russia. Interview with the member of the Federation Council Committee on agrarian and food policy and nature management Verhovskim A.G.; Cherny V.V.Globalization of Democracy: Intellectual Revolution of “Information society” and “Dark Matter” of the Global Financing; Oganesyan S.S. The national idea of modern Russia through the prism of the New Testament, the Torah and the Quran (part 2); Soshnikova T.A. 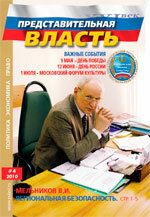 The constitutional right to education and educational services; Belyakov A.V. Pricing of medicines and compensation of expences in European Law; Grankin I.V. Parliamentarism development – a condition of strengthening of democracy; Interview with the Deputy Chairman of the Committee on culture, people's artist of Russia, laureate of the State prize of Russia, film Director V. Bortko. Several other articles also deserve mentioning: Sivkov A.L. 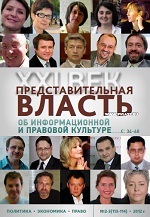 The state Duma: a time for change; Burinova L.D. Constitutional and legal status of regions of Russian Federation; Bocharova E.V. the Institutional- organized structure of the realization of general fishing policy in the European Union; Antipyev K.A. Political parties in forming representative organs of local self-governing. Other important topics include articles by the following authors:Schitova N.G. XI Congress of the peoples of Russia "We - the people of russia: the unity of diversity"; Varlen M.V. Interaction of deputies of two levels: deputies of regions of the federation and of municipal units, as an essential condition of the exercise of public power on the territory of the region of Russian Federation; Oganesyan S.S. The national idea of modern Russia through the prism of the New Testament, the Torah and the Quran (part 1); Lyubimov A.P. The legal framework for the certification of specialists in the field of conservation and restoration of objects of cultural heritage; Trunov I.L. Expert-legal analysis of an independent investigation into the causes of crashes in Russia; Trivaylo A.V. Content of the legal capacity of member states and international organizations for an international agreements conclusion; Khubiyeva M. Obligations of international organizations concerning UNCLOS rules on dispute settlement. Several other articles also deserve mentioning: Bocharova E.V. - Legal regulation of the market for the fishing production of the European Union; Denisov L.A., Savicheva N.M., Fedorovich A.V. The power-formation-public health services and formation of a healthy way of life; Gadzhiev I.A. 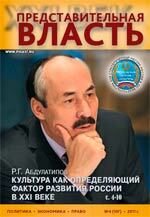 Problems of rational use of agricultural lands;Interview with the Osipov V.K. FRIENDSHIP TESTED BY AGES. Other important topics include articles by the following authors: From the editorial office. The fifth international symposium "Universities of culture and arts in the world educational space" (d. Dushanbe, Republic Of Tajikistan); Abdulatipov R.G. The report on V international symposium "Universities of culture and arts in the world educational space" (d. Dushanbe, Republic Of Tajikistan); Belyakov A.V. Patient’s rights to receive health care in the European union in the light of the Keller case; Lyubimov A.P. Formation of the concept of national innovation system of Russia (part 1); Laletina A.S. Third EU Gas Directive: legal models for splitting integrated gas companies; Gurbanov R.A. The European bench warrant about payment and the European manufacture under the permission of insignificant disputes as tools of cooperation of EU member states in sphere of civil justice; Lubinko Mitrovich.Violence in the family as an offence; Spector A.A. Public prosecutor's supervision and the coordination of carrying out of revisions by bodies of the state control in sphere of entrepreneurial activity. Several other articles also deserve mentioning: Matvienko S.V. Who is the owner of municipal property? ; Karpov E.A. Perfection of civil - legal legislation about private property; Dmitry A. Ezhov, A Future Party Configuration of the 6th State Duma;Savushkina O.V. Parliamentarism as a factor of sustainable development and political stability of the Russian society. Interview with the First Deputy Chair of the Federation Council Committee on Economic Policy, Entrepreneurship and Property V.K. Gusev. Residence on the Costa Brava ROYAL VICTORIA COMUNITY RESORT - old age in joy. Annual address of President D.A. 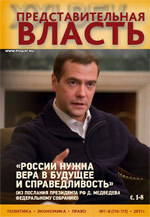 Medvedev to the Federal Assembly is the main topic of issues No.7, 8 / 2010 of “Representative Power – Century 21”. 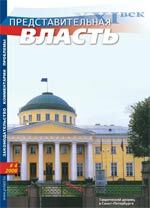 The head article of No.2-3 (2010) of «Representative Power - Century 21» is written by G.Voronin and dedicated to problems of technical regulations in the Russian Federation. 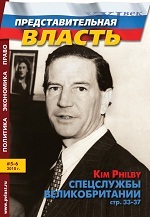 Other important articles include: Realization of Constitutional Provisions on Culture by G.Ivliev, Problems of Philantropy, Patronage, and Sponsorship by N. Schitova, Transfer of Russia's Capital by V.Rossman, Baikal Is in Danger by V.Savchuk, The Phenomenon of Extremism in Multi-Ethnic Russia by H.Kireev, as well as an interview with the First Deputy Chair of the Federation Council Committee on Economic Policy, Entrepreneurship and Property V.Gusev. 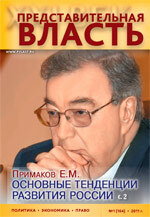 The issue contains reviews of new books: S.N.Komissarov. Looking for the way forward. Оptimistic notes about a pessimistic book. Review of “Death Wish (Philosophy of Crisis of the Global Man)” by R.Abdulatipov (M.: Classics Style, 2007); A.P.Lyubimov, P.I.Akayomov. Perestroika: Retrospective and Lessons. Review of “Ideology Returns” by B.F.Slavin (M.: Social and Humanitarian Sciences, 2009). 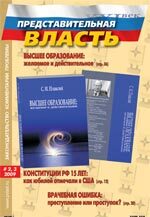 Articles: The Concept of Citizen Social Protection and Its Features in the Russian Federation by L.Lychkan; On some particular qualities of local governance in closed administrative-territorial entities by A.Vlasenko; «Forewarned is forearmed» (certain legal problems of prevention of infringements of the rights and interests of investors in the share market) by A.Abrazhevich; Development of Financial Control in the Russian Federation by Ya.Kleimenov. Our congratulations with the 80th Anniversary of the Moscow State University of Culture and Arts. 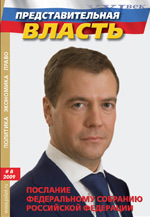 State of the Union Address of the Russian President Dmitry Medvedev and Alexei Lyubimov’s article on death penalty in Russia are the main publications in issue 8 (2009) of the magazine. 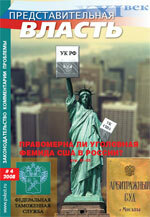 Other significant publications of the issue include: “The “Captive Nations” Resolution as a Cold War Relic” by Wladislaw G. Krasnow, Ramazan Abdulatipov’s and Russian Minister of Culture Alexander Avdeev’s materials about a meeting at the Moscow State University of Culture and Arts, “Protection of Ancient Monuments and Historic Buildings in Great Britain” by Alexander Domrin, “The Role of the Youth in the Legal System of a Society” by E. Pevtsova, “The Influence of Historical Formation and Development of the Multiparty’ Principle on the Process of Lawmaking in Russia” by A. Kalinin, “On the social state function in a sphere of public-legal regulation of the Russian Federation” by N. Кosarenko, “Systematization of Various Options of Legalization of Criminal Income” by T. Melnik, “The conceptual terms in sphere of migratory relations” by I. Shoyko, as well as I. Borisov’s review of a book "Legal support of the electoral process in the interests of Russian national security".by V.V. Krasinsky. “The Justice Coefficient’ of the World Political and Economic System” by E. Chensky and V. Cherny is the lead article of issue 7 (2009) of the magazine. Innovation Policy is the main topic of the latest (No.4, June 2009) issue of “Representative Power – 21st Century”. 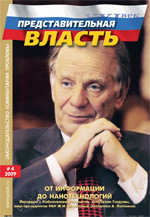 Among other materials it contains: - an interview of Editor-in-Chief Alexei P. Lyubimov with a Nobel Prize winner, member of the State Duma, Academician and Vice President of the Russian Academy of Science Zhores I. Alferov; - From Information, Information Processes and Technologies to Nanotechnologies”; - On Problems of Formation of a New International Financial Architecture” by Eugeny M. Primakov. 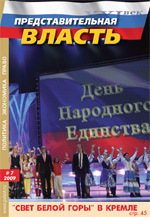 The main topics of December 2008 (No.8) issue of "Representative Power - Century 21" include State of the Union Address of the Russian President D.A.Medvedev and articles by A.Lyubimov, V.Baev, I.Kovalski, A.Domrin and I.Marino dedicated to the 15th anniversary of the Russian Constitution. Other important topics include: new anti-corruption bills of the Russian President by I.Trunov; the 15th anniversary of the International Academy of Information, Information Processes and Technologies by A.Lyubimov & L.Myrova; on electronic information technologies and development of legislation on public security of a human being by O.Stepanov; analysis of the bill "On State Youth Policy in the Russian Federation" by M.Puhkalova; on medical insurance by V.Filipkov, etc. The issue also contains Index of authors and articles that were published in the Magazine in 2008. Pro Memoriam section of the magazine is dedicated to a member of our Editorial Board, President of the Moscow State Law Academy, Academician, Professor O.E.Kutafin. The new issue of our magazine is out. 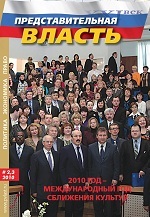 The main themes of this fourth issue (June 2008) of “Representative Power – 21st Century” are Vladimir Putin’s speech before the State Duma and V. Chernov’s article on criminal justice in Russia and the United States. Other important themes include: B. Gryzlov’s article on the development of parliamentarism; O. Stepanov on cyber crime; V. Likhachev on Russia’s role in the international legal community; and A. Lubimov and S. Sirotenko on lobbyism. Other articles of interest include: S. Pepelyayev on modern courts of arbitration and B. Osipyan on legal culture. 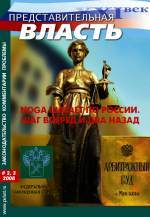 The main themes of the 2-3 edition (March-May 2008) of the magazine are the articles by N. Lityagina and V. Cherny on the economic security of Russia and on how American lawyers are preparing a “Noga-2” case. Other important themes include: an interview with V. Gusev; an article by I. Bartsits on signs of the effectiveness of state control; A. Lyubimov and A. Sayko on encyclopedias of civil service and state control; V. Likhachev on Russia and the international legal community. Other items of interest include: a piece by I. Trunov on the modern demand for securing air cargo, B. Osipyan on the lawmaking process and others. The main theme of Issue 1 (January, February) of 2008 is the article by I. Bartsitsa on analyzing the effectiveness of state institutions. 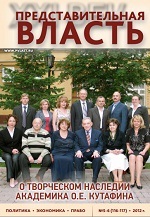 Other important materials include an article by S. Polenina, O. Gavrilov and N. Koldaeva on problems with cooperation between different legal system amid globalization, V. Gustov on parliamentarism in the Commonwealth of Independent States, M. Somov on the primary criteria of the systematization of state organs in Russia, A. Berdashkevich, N. Bulaev and A. Kalinin on the legal regulation of citizens’ appeals concerning education and science and V. Chernov on the theory of the clash of civilizations. Other articles of interest include I. Ibragimov on the definition of “victim” in a legal context, N. Kornushov and S. Pepelyayev on the Russian Civil Code and others. 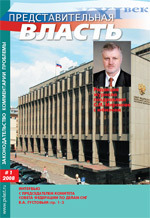 A new issue of “Representative Power – 21st Century” (No.4, July-August 2006) opens with a continuation of an article by deputy Sergei Glotov on Russian law-making; the article contains many statistics. Others publications of interest include articles “Russia and OSCE” by V. Cherny, A. Alyaev and V. Tsekalo; on civil society – by M. Fomichenko; on federative relations – by A. Sadyka and L/ Konopel’ko; on land – by Andrei Goltsblat; on the Cossacks – by D. Pen’kovsky; on the Azerbaijanis – by I. Gasanov. We would also like to draw your attention to a review of a book “Madness of Power” by S. Barzylov and A. Chernyshev; and an article by Z. Bagishaev and S. Oganesyan on fight against terrorism. 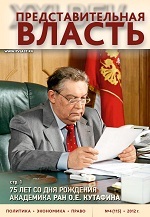 This issue of the magazine features articles on Russian legislation (loaded with statistics) by the State Duma deputy S. Glotov; European integration by A. Lyubimov; economics and law by the Federation Council member V. Gusev; equivalent of human life’s cost, arbitration, administrative law, problems of the Cossacs, elections, science and culture. The main topic of the issue is law-making activity of the representative branch of government. Four articles – by Doctors of Law S.A. Glotov, V.V. Komarova, Yu.A. Dmitriev, A.G. Gurinovich – are dedicated to this subject. Other materials include articles by Doctors of Law I. Trunov, A. Aivar, G. Kharisov on cost of life; D. Pen’kovsky on problems of Cossacs. 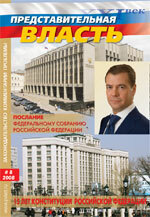 This issue also features conclusion of an article by S.G. Pepelyaev on VAT, and material by I.B. Borisov and A.V. Ignatov on elections in Azerbaijan. The main topic of this issue is Russian parliamentarism, the 100th Anniversary of the First State Duma, representative branch of government in Russia. 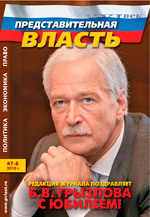 Six articles – written by Chairman of the State Duma B. Gryzlov, Chairman of the Central Election Commission A. Veshnyakov, Editor-in-Chief of «Representative Power – 21st Century” A. Lyubimov, M. Kurmanov, B. Osipyan, I. Kirpichnikov - are dedicated to this topic. This issue also features conclusion of an article by Chairman of the State Duma Committee on Education and Science N. Bulayev on the Russian system of education. Other materials include articles on judicial and administrative reforms in Russia, on referendum, on arbitration, and on elections in Azerbaijan. 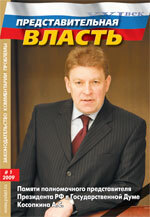 This issue of the magazine «Representative Power – 21st Century” features articles by A. Lyubimov on law-making of the Federation Council in 2005 and the main conclusions of the chamber’s activities; by Chairman of the State Duma Committee on Education and Science N. Bulayev on the Russian system of education; by Academician Dmitry L’vov on the problems of Russian economy. A series of articles is dedicated to arbitration, administrative, criminal and other areas of law and legislation, legal conflicts. You shouldn’t overlook N. Popov’s review of a book “America: Yesterday and Today” by E. Bazhanov. 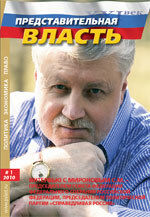 The issue contains an exclusive interview with the Head of the Russian Orthodox Church Patriarch Alexei. 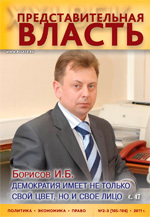 Other materials include articles by A. Sitnikov on legislation on corporations, and by I.L. Trunov and I.B. Borisov on elections in Kazakhstan.